A Korean classy lady consulted me today. She was suffering from cervical spondylosis and has attended my hospital regularly. She has been put in traction and other physical medicine. 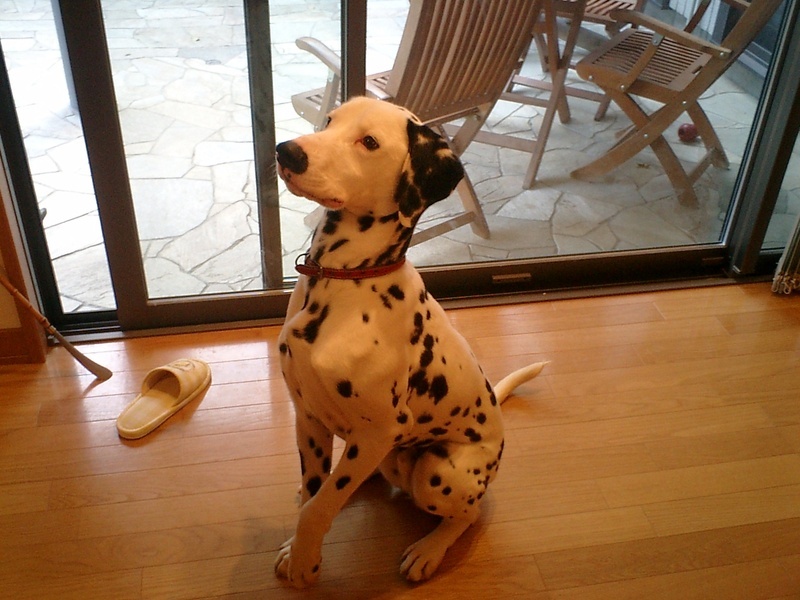 To tell the truth, I have been trying to speak to her in Korean, but I couldn't. I didn't have enough confidence in my skill in Korean. There always are some Korean texts on my desk at OPD. When the stream of patients are split, I make it a rule to look over them. She gave a glance at them and talked to me about the Korean language. I realized that it was my chance. "잘 지냈어요" (How have you been?) I uttered lamely. My voice was so weak, but she completely understood my Korean words. I was very happy. Mocha came back from his school. He has been there for 2 months because of his bad behavior. He has been trained by a professional trainer who raises police dogs and service dogs, like guide dogs. The trainer told us, "He looks like he's under a spell and it isn't really him. It's important to keep him under this magic spell all the time. Petting him is completely different from spoiling him." Those are meaningful words. He got so calm with other dogs and people. It's fun to walk him in the early morning. It might be good medicine for my status. As I wrote before, I'm on the border between the metabolic syndrome and the normal range. I took my car to the car washing station this afternoon. When I had my house built, I designed my garage myself and I meant to make it easy to wash cars. However I don't really feel up to washing my car myself. It took a lot of time and I feel it's rather a waste of my time. Washing cars is different from cleaning my room. I mean, anyone can wash my car. I sometimes ask someone to wash my car. 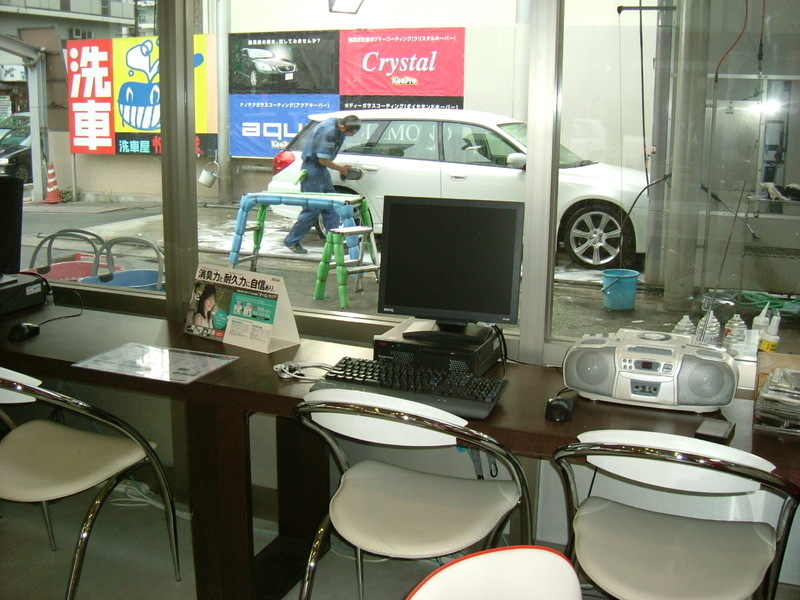 The photo shows the inside of the car washing station which I often visit. You can see a PC, which is connected to the internet. I'm writing this entry on it. At the same time, I can read e-zines here over a cup of coffee. I have a Gmail account. I like the web mail because I can read and write e-mails anywhere like this. I've been studying the effects and side effects of Lasik, eye surgery for vision correction. My eyesight is failing and this is very inconvenient when I ski or ride a motorcycle and I want to enjoy various types of sunglasses. I fully understood, after two weeks' investigation, that Lasik is an extremely safe operation and very effective. I decided to have Lasik. Today I consulted an ophthalmologist near my hospital, taking an hour off. I wanted to have a second opinion from a specialist. He showed me some technical papers on the complications of the Lasik operation. Those complications occurred in only the early period of the introduction of Lasik surgery. I felt relieved to hear that. However, he added, "Is your work ok?". "What do you mean by that? ", I answered. He continued that Lasik will give me better eyesight and I will feel refreshing and it will be good for outdoor activities, but it's only for far sight. I will need some pairs of glasses for the near and very near side. It might be inconvenient for my job. When working, my eyesight must be focused on around my hands when I stretch my arms for 5 or more continuous hours. At the last moment, I gave up having the eye surgery. The chief teacher of my youngest daughter visited my house today. My wife took a half day off and was home in the afternoon. The teacher took charge of her class this spring, so it was the first time for her to talk with him privately. He seemed to be a nice guy to talk to and seemed to look as if he had been around the block according to my wife. My wife heard about the daily activities of my daughter in her school and felt relieved. My daughter seems to be doing fine and enjoying school life. More than a quarter of a century has passed since I became a doctor. At the same time, more than half of my lifespan has passed. I often ruminate on how many people I have seen as a doctor. When I was just a resident, I quaked in my boots. I was not confident in my skills and was constantly with my superiors because I feared that my conduct might do patients harm. How many operations did I carry out? More than 5000? More than 10000? Some of them were not successful. There were times when the intense bitterness of failure brought tears to my eyes. Can I become a better doctor after a hard quarter-century of working? Can I catch up with the level of my superiors? I'm not sure. I've performed many major and minor surgeries. I think I must have saved many lives, but I don't remember those successful cases well. What I remember the most are the unsuccessful cases. I can't get those patients and their families out of my system. There were many patients that had serious aftereffects. They survived the serious illnesses, but their daily activities were severely restricted. Patients who had a total resection of colon will suffer from severe diarrhea. Patients who no longer have their urinary bladders will have to manage their urination all the time. Patients who had limb amputations and the patients with cord injuries after accidents,,,,,,all of them are probably alive now, but I wonder what their daily lives are like? I especially remember Kaori, a young lady, who had surgery for ulcerative colitis early in life. Kaori was very afraid. I did my best to reassure her. The surgery went well, but Kaori will always suffer from severe diarrhea. If Kaori is alive, she is in her thirties now. I hope she is doing well and has made peace with what she must endure. While I already feel that I have given patients up-to-date medical care, I have mixed feelings about whether the methods or procedures that I selected were actually helpful and suitable for each patient. I probably will continue to work in the medical field for two more decades. What kind of care can I provide for people? I'd like to do my best as diligently as ever. I still study new techniques. I know I must question the validity of each procedure and constantly consider better ways of doing each one. I must take into account the patient's quality of life. What I hope for the most is new technology and better drugs because ultimately I can only provide that which is available. I want more for my patients. I want complete healing. He questioned the validity of the argument. More than a quarter of a century has passed since I became a doctor. Besides, more than a half of my life span has passed. I ruminate about how many people I saw as a doctor. I was always quaking in my boots when I was just a resident. I was not confident about my skills and was always with my superiours for fear that my conduct might do patients harm. How many operations did I carry out? More than 5000? More than 10000? Some of them were not successful. I sometimes brought tears to my eyes with intense bitterness. Could I become a better doctor after a hard quarter century of working. Could I catch up with the level of my superiors? I'm not sure. I've performed many major and minor surgeries. I think I must have saved many lives, but I don't remember those successful cases well. All that I remember are the unsuccessful cases. I can't get those patients and their families out of my system. There were many patients that had serious aftereffects. They could survive serious illnesses, but their daily activities would be severely restricted. The patients who had a total resection of the colon would suffer from severe diarrhea. The patients who don't have their urinary bladders would have to manage their urination all the time. The patients after limb amputations and the patients with spinal cord injuries after accidents,,,,,,all of them are supposed to be alive now, but I wonder what their daily lives are like? While I already feel that I have given the patients up-to-date medical care each time, I always have mixed feelings that the methods or procedures that I selected were actually correct and suitable for each patient. I might be going to work in the medical field for two more decades. What cares can I provide for the people? I'd like to do my best as diligently as ever. 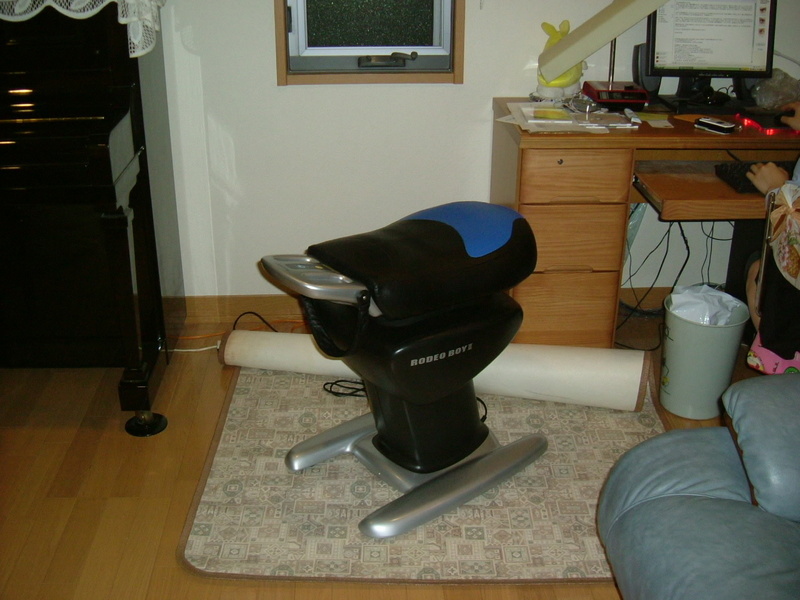 I got an exercise machine, rodeoboy2 that you can see in the photo. As I wrote before, I'm on the border of the metabolic syndrome. I decided to exercise with it. It doesn't make noise, so I can use it while watching a TV. Japanese electronics giant, Panasonic, manufactures the similar machine, joba, which means "riding a horse" in Japanese. It costs more than 1000 dollars. To tell the truth, I'd like to use it because joba has various moving patterns and has reliable evidence that it can reduce the weight. On the other hand, the price of rodeoboy2 is 200 dollars. Though the rodeoboy2 has no research data, the movement of it is similar to joba, so I bought it. Some of my friends are waiting for my report. If it turned to be effective, they are supposed to buy it. I was listening to the NHK radio program tonight. I was astounded to hear my eldest daughter's voice on the radio waves. The program is gathering Tanka (Japanese traditional poetry) from teenagers and criticizing them, then selecting the best one live. My daugher was one of the judges. It might be kind of a side job for her. Anyway, I have to ask her why she was in the NHK broadcasting station. When my wife's parents were fit and well, my family stayed at their house a few days a year, especially in the summer, because the climate is cool and comfortable. We have left my wife's goods that she had been using in her single days. My family was using her room after our marriage when we visited the parents' house. However, there wouldn't be many more times to visit the house from now. We took them back to my house today. Is the change of generation always like this? A lot of goods that my wife's father had been using got to be done away with. His clothes, shoes, furniture and daily necessities, all such kind of stuff will be thrown away. Is the change of generation always like this? A tatami mat is enough for a man to lie on, a half is enough to sit on. This is a Japanese proverb that implies that we must be modest, never arrogant. No man can carry his own stuff to heaven. Today was the day I was obliged to think about many things deeply. Recently I have been regularly watching a weekly TV program titled "Professional (NHK)". The program features interviews on individuals who achieved success overcoming failures or adversities. I joined its viewers because I get energized so much as I listen to every interviewee's story on his/her experiences or his/her view on life. Besides watching it when aired, I sometimes videotape it and watch it when I feel blue to cheer myself up. Stahl's report is scheduled to air tonight after the news.